Silvery gill-rockers wriggling on the beach? That's about to happen, for real. The grunion have a schedule to keep, and so do you, if you want to see these oceanic wonders head onto the sand to spawn. 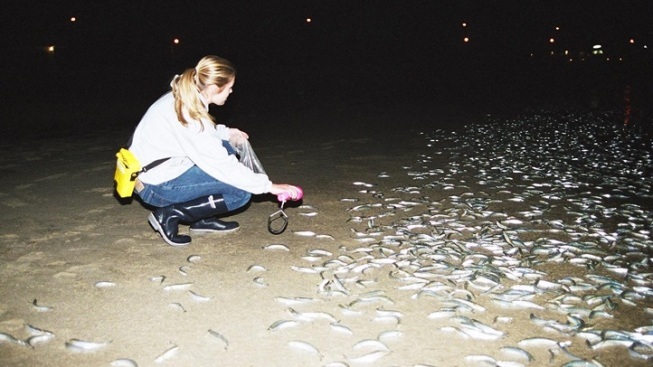 A good place to admire all things grunion? Cabrillo Marine Aquarium in San Pedro. The denizens of the seas, from the largest whales to the smallest of sardines, don't post messages on the official internet of the ocean whenever humans go wading within the waves of their vast and watery home. Well, we don't think so, but maybe we don't have the right password to the ocean's internet? Probably. We definitely get pretty jazzed when we see fishies wriggle up on land. So much so that we plan special events around the occasion, quite often, and stir up anticipation weeks in advance. And in Southern California? That anticipation begins as February gives way to March, and the season for welcoming the grunion wriggles into view. These are the silvery silversides fishes that make their triumphant way to our sandy shores, over a number of select nights each late winter, spring and summer, to spawn. And because this on-shore event is tied to the tides, we generally know when and where these gill-sporting superstars'll be. One popular place to see this always astounding rite of gruniondom? The Cabrillo Marine Aquarium, in San Pedro, which hosts a number of Meet the Grunion evenings, plus a Grunion Fishtival, each spring. The 2019 dates have wriggled their way onto the aquarium's web site, so take a swim by that page now and decide if one or more of the listed nights works with your own schedule. A schedule, we will assume, that isn't tied to the tides, but we don't know. Maybe you run your whole life according to the movement of the big water. If so, well, rad. Maybe our fish friends are onto something. Beyond the Cabrillo Marine Aquarium grunion events? There shall be other grunion runs, in other grunion-laden locations, yes, and this California Department of Fish and Wildlife has them in a helpful month-by-month format, with best times included. Keep in mind that some periods will fall under the "Closed Season" header and some will be "Open," meaning you may gather grunion by hand. But? A fishing license is required, and there are other important rules, so read all. How stoked are you that springtime and silversides time are shimmying back onto the sandy shores that abut our SoCal lives? It isn't magic, it's science, but each March a person can feel a little more joyful at the idea that, yes, sometimes the ocean just ups and visits us, right here on land.